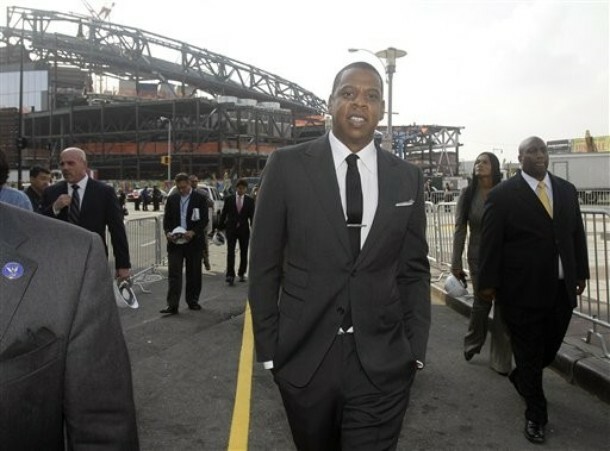 Nets part-owner and hip-hop mogul Jay-Z gestures during a news conference in front of the Barclays Center, under construction in background, as Brooklyn borough President Marty Markowitz, right, looks on Monday, Sept. 26, 2011 in Brooklyn, N.Y.
*Jay-Z announced Monday morning that the Nets will be called the Brooklyn Nets when the team moves from New Jersey to its new home next fall at the Barclays Center in Brooklyn. The hip-hop mogul also announced that he’ll headline a series of concerts — as many as eight — at the arena when it opens, the New York Daily News reports. 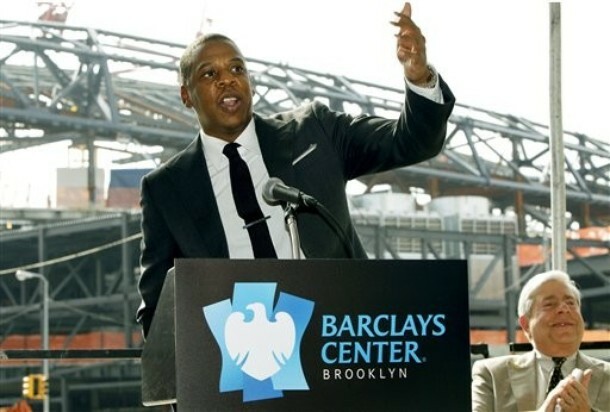 Jay-Z, whose real name is Shawn Carter, owns a small stake in the Nets, according to My Fox NY. He grew up in the Marcy Houses, a public housing complex in the Bedford-Stuyvesant neighborhood of Brooklyn. “This is my foundation,” he said in an interview with Good Day New York’s Rosanna Scotto (available below). “I’m really giddy right now,” he added, clearly excited by the announcement. The Barclays Center is being built as part of the Atlantic Yards development in the Prospect Heights neighborhood of Brooklyn. The controversial project was announced in 2004 but has been mired in delays.